Latch Hook Tree Skirts can add a phenomenal accent to your holiday decorations, as well as give you the opportunity to give handmade gifts for the holidays if you so desire. 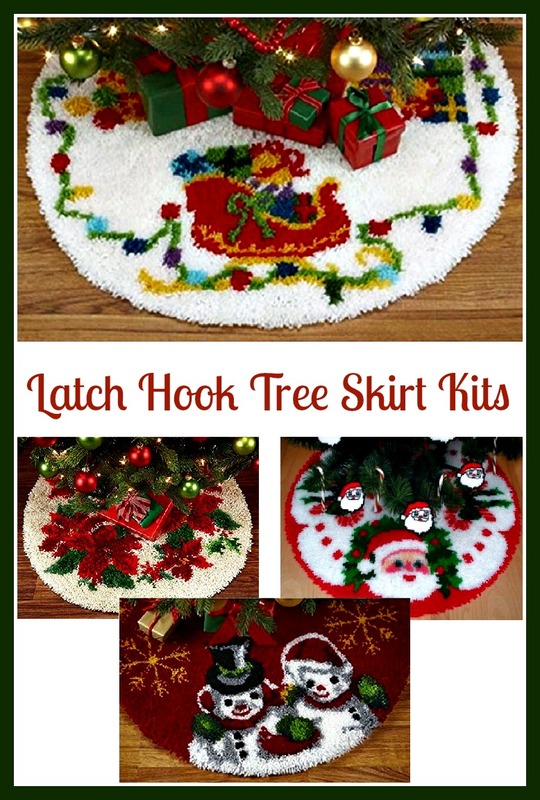 There are many Latch Hook Tree Skirt Kits ready for you to make, or you may prefer to create a unique tree shirt from amazing half round latch hook rug kits. When you are using a half round latch hook kit to create a latch hook tree skirt, you can mix and match (so your tree skirt is reversible) or use two of the same design so your tree skirt design continues around the tree. Whether you are adapting a half round rug kit or creating a latch hook tree skirt from a complete tree skirt kit, you are sure to find your results are stunning. No doubt, everyone will appreciate the love and attention you put into creating this beautiful holiday decoration and keepsake. This is certainly a pretty tree skirt. I love the name! It is a wonderful reminder that we are often surrounded by life’s best gifts at Christmas. Even if a loved one can’t be with us, they are definitely remembered and are in our hearts always. Poinsettias are a very popular decorating choice during the holidays. Personally, I love the poinsettia flower, but I opt to avoid using real poinsettias in my home because we have pets. A poinsettia can poison a dog or cat and make them sick, so I prefer to find other ways to incorporate the beloved flower into my Christmas decorations. Making and using a poinsettia latch hook tree skirt is the perfect solution for pet owners who love poinsettias. The red poinsettia latch hook kit would certainly make a beautiful tree skirt. Aside from the beauty of the “shag” appearance of these tree skirts, there are several advantages to using the latch hook kit and technique for a tree skirt. The most important advantage is durability. One of these tree skirts will endure over time when it is displayed year after year for holiday decorating. Latch hook is also an extremely fast and easy craft. Even a child can complete the easiest latch hook patterns. With a kit, you will often have left over yarn pieces. 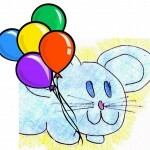 Keep them! They make it easy to replace small sections if need be. When it comes to caring for your latch hook tree skirt, of course, you will want to store your tree skirt in a safe and insect free area when out of season. You would spot clean your tree skirt with a mild soap in most cases, but you would want to check the yarn instructions and clean according to the directions included with the yarns you use. 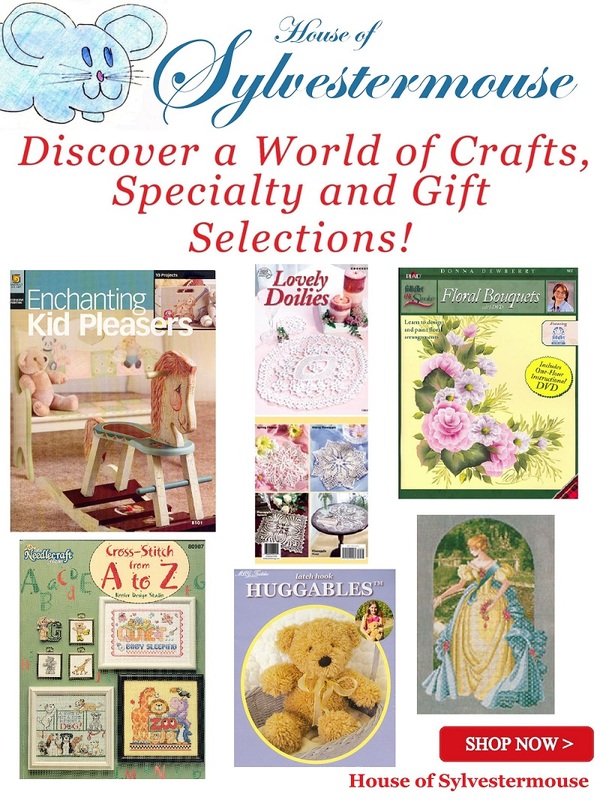 Creative, cheerful and colorful craft kits allow you to add elements of surprise and delight to your decor at Christmas time. Bring the joy of colorful Christmas themes like this snowman latch hook tree skirt into your home. Part of the very real beauty of making latch hook tree skirts is that you are giving your home a loving touch which only hand crafting can provide. Many people are escaping the red, white, and green color scheme used most often in the Christmas decorating and in the decorations we see most of the time. One way to do this is to find the colors you want to use in an inspiration piece like this Kaleidoscope Tree Skirt. Imagine the colors used in this kit as your Christmas decorating inspiration. Choose your favorite color for the primary and two alternate colors as accents. Then use these colors throughout your home this year when decorating for the holidays. If you should choose this particular kit, you will need to cut the center out of it to use it as a tree skirt. You would also need to cut the opening slit. 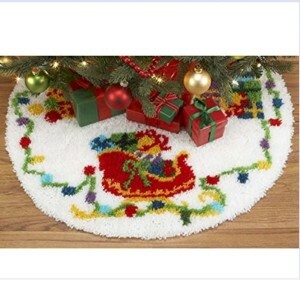 If you can’t find a tree skirt kit that you like, you could select a latch hook rug or wall hanging kit. This is a great idea to create a unique latch hook tree skirt. One way to adapt the kit(s) to make a tree skirt, would be to attach the completed latch hook to a pre-quilted tree skirt using the fabric tree skirt as your foundation. Use one kit to embellish the quilted tree skirt, or use two or three kits to complete a tree skirt with continuous design all the way around. If you would like your latch hook tree skirt to encircle the bottom of the tree you can use three kits and connect them edge to edge or by slightly overlapping them. The design itself will determine whether you want them to meet edge to edge or whether you want the pattern to overlap for a continuous finished pattern. This should be done before you actually hook the yarn to the canvas. You will need to cut a circle in what will be the center of the tree skirt to surround the tree trunk. Remember to leave one edge open so you can wrap it around the bottom of the tree. You can use multiple kits to create a tree skirt, wall hanging, or a welcome mat. You could even make several rugs and continue the design throughout the house. Share Latch Hook Tree Skirt Kits with Friends! How very pretty. Christmas Trees just aren’t complete without a tree skirt and you have shown us some lovely ones here in themes for any decor and interest. I’ve never tried the latch hook craft, but being the crafty person that I am, learning this as a new craft would be great fun!